What Does Research Mean To NET Patients? When looking for a place to eat, we turn to Yelp. Before purchasing an item, we might first read reviews on Amazon. The internet makes information readily accessible at our fingertips so that we can do our own research. This type of research is educational. When it comes to a health issue such as cancer, we often turn to the internet to learn more about our own disease in order to make the best possible decisions for ourselves. Knowledge is empowering. There’s so much information on the internet that it can easily feel overwhelming. On the one hand, you might come across discouraging statistics. On the other hand, there are many online virtual health communities such as Inspire.com, ACOR, and Facebook groups that provide much needed emotional and psychosocial support. They can be great opportunities to connect with other patients and learn from their experiences, but these online support groups may not be the best sources of health information. You should always discuss any information with your medical team to see how it relates to you. Accuracy: Does it use reliable research? What are the sources? Authority: Look for sites with expertise in NET. Look for sites from established institutions or foundations. How many NET experts are involved in the source? Do those NET experts agree or disagree? If you can, ask a NET expert about the information you read. Beware of Bias: Information should be balanced and give the pros and cons of any proposed treatment. Consider the purpose and mission of the website, who is writing the article, where the article is published, and any sponsors or sources of bias. Typically, medical journals, medical institutions, medical organizations, and foundations follow strict guidelines to minimize bias. This is why authors and speakers state any potential conflicts of interest at the beginning of a book or presentation. Be skeptical of sites trying to sell you something, especially if they are offering a “miracle cure.” Sadly, cancer patients are vulnerable and often the target of scams. The Federal Trade Commission (the government agency that identifies and tracks scammers) has an excellent article on how to spot a cancer scam. Current: Check the date to see how recent the information is. The world of NET diagnosis and treatment is changing rapidly, so information from a few years ago may be outdated. Weigh Opinion/Personal Experience vs Information: While personal blogs and anecdotes are helpful, they may or may not relate to your situation. Comparing individual cases to clinical trial data can be as different as comparing two different types of food groups. What research is backing up the information? Carcinoid Cancer Foundation, the oldest NET nonprofit organization in the United States is a wealth of information. Healing NET Foundation aims to optimize the care of those with neuroendocrine cancer through the education of and collaboration among physicians, health care providers, patients, and caregivers. North American Neuroendocrine Tumor Society (NANETS) is dedicated to educating medical professionals on the diagnosis and treatment of NET disease and supporting research and innovation in the field. NANETS develops and publishes consensus guidelines on the management of treatment of NET. 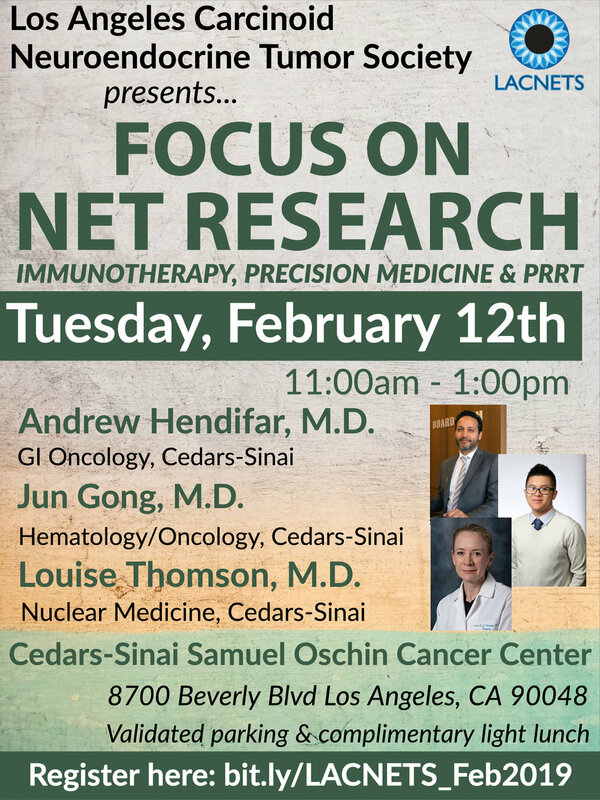 Neuroendocrine Tumor Research Foundation (NETRF) funds research to discover cures and more effective treatments for neuroendocrine cancers. NETRF also has an excellent list of NET Medical Worldwide. NorCal CarciNET is one of the largest patient support group. Their website, Facebook group, video library, and newsletters often features the most up-to-date information about NET including live interviews with NET specialists from around the globe. Cancer.Net is a resource from the American Society of Clinical Oncology with oncologist-approved cancer information. ClinicalTrials.gov is a database of publicly and privately funded human clinical trials conducted around the world. National Cancer Institute (NCI) is part of the National Institutes of Health, which is the U.S. government organization that funds cancer research and training. Their website provides a host of information on various cancer types and cancer-related issues. National Comprehensive Cancer Network (NCCN) is an alliance of the leading cancer centers across the country that develops and publishes up-to-date, evidence-based practice guidelines called NCCN Guidelines. These patient guides serve as an excellent resource in discussions with your medical team and in guiding treatment decisions. The latest NCCN guidelines for NET was recently published in 2018 and is endorsed by the Carcinoid Cancer Foundation, the Healing NET Foundation, NCAN, and NETRF. PubMed is a database of biomedical literature maintained by the U.S. National Library of Medicine and the National Institutes of Health. This is a very extensive database that requires narrowing the search with specific keywords. Research your cancer online: dive in or steer clear?